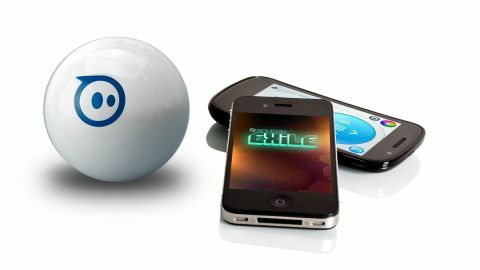 If you want to have some fun with your phone (or tablet) then this Bluetooth robotic ball takes some beating. It looks set to stay too - thanks to a growing library of free and low-cost games. The Sphero robot ball gaming system is a great new take on smart toys for smartphones - and big kids of all ages will love it. Launched last year by US company Orbotix, the Sphero comprises a 74mm diameter opaque ball made from tough polycarbonate, inside which lies a multi-axis gyro, an accelerometer and a bunch of motors that can send it speeding in any direction at up to 0.91m-per-second indoors or out. You can even dunk in the Sphero in water, if you wish, as it's waterproof and will float in your bath or sink. The 168g Sphero is powered by a lithium polymer battery, which is also stowed away inside, with recharging provided by the supplied induction charger, enabling the ball to be charged wirelessly. The real fun is provided by a series of multi-coloured lights which enable the ball to display millions of colours. And the whole shebang can be controlled by your smartphone or tablet (iOS 4.0 or higher, Android 2.2 or higher only) via Bluetooth with an operating range of up to 15m. Clever. What's even more clever about the Sphero though are the apps that you can use it with. Orbotix has not only made around 10 of its own - mostly-free apps - available for download from the iTunes App Store and Google Play, but it's also giving game developers a chance to come up with their own thanks to a Full API and Mobile SDK. Heck, you can even have a stab at programming the Sphero yourself - thanks to a free Orbotix app called Sphero Macrolab (iOS / Google Play), giving it geek appeal aplenty. The Sphero range of games runs the full gamut from banal right though to bizarre. The free, if basic, Sphero app (iOS / Google Play) enables you to steer the ball around using your iPhone, iPad or Android phone or tablet and makes it display lots of pretty colours; while Sphero PinWheel (iOS) enables to play a very modern version of Simon - the colourful memory game beloved of entertainment-starved kids in the early 1980s. Other games enable you to use the Sphero as game controller. To do this, you simply hold the ball in your hand with the white light at the top and your thumb strategically placed over the blue 'taillight' on the side. Used in this way, you can make in-game characters go up / down, left / right and spin around, which comes in handy for space shoot-em-up games like Orbotix' Sphero Exile (iOS / Google Play) or Nyan Cat Space Party (iOS / Google Play), which are both variations on a theme. One of our favourites though is Sharky The Beaver - an augmented reality game, where the ball magically turns into a shark fin-wearing beaver who you have to fling cupcakes at. We also love Chillingo's Zombie Rollers (iOS), where get to roll around spooky city streets in a virtual ball splatting zombies until, that is, the virtual ball suddenly disappears leaving you to fend for yourself until you can hop into the next one. Eek! As you've probably guessed by now, Sphero is a lot of fun. Pairing with your smartphone or tablet using Bluetooth is straightforward and the controls - in freewheeling robot mode - are easy to get to grips with. Sometimes the ball can get its up / down and left / right controls confused - something that seems to happen quite a bit when you try a special trick or macro - although it's easy to get it reoriented again by holding two fingers down on your touchscreen and swivelling the ball until its blue tail light is pointing in your direction again. Using the Sphero as a game controller has its frustrations too - sometimes you're so busy watching the action on screen, you don't notice that the ball has shifted position on your hand until you end up crashing into that spaceship you were trying to avoid or running towards rather than away from the zombies that are chasing you. Clearly this doesn't happen with regular game controllers where you get tactile feedback from the pads, grips and buttons, but you get no such thing on a smooth-faced ball. Luckily, your scores can and do improve do practice - although it's still a bit like trying to pat your head and rub your tummy at the same time. For some games, using the device you're actually looking at as the controller is actually the best way to go. Another frustration is the Sphero's battery life: although it'll last for up to an hour before losing its juice - pretty good for a smartphone toy - you'll face a frustrating 3-hour wait before you can get the ball rolling again. The final frustration, perhaps, is the price: at £100 the Sphero is undoubtedly an expensive proposition, but then so are many toys and games that people like to buy themselves or their kids. Have you tried to buying a decent-sized Lego set lately or taken the family to the zoo, the cinema, a day out at Harry Potter world? Put it into that context and the Sphero starts to look like very good value for money - especially when you consider its versatility, programmability and go-anyhere, do-anything high tech robustness. When you think of it like that, that £100 starts to look very good value indeed. As smartphone toys go, the Orbotix Sphero has a lot of recommend it. It's easy to setup and fun to use - thanks to a variety of largely free and low priced games. The Sphero itself isn't perfect - sometimes, the ball's controls get a little eccentric during play - but if our biggest complaint is that its one hour battery is too short that only goes to show how great it is to have this ball around.